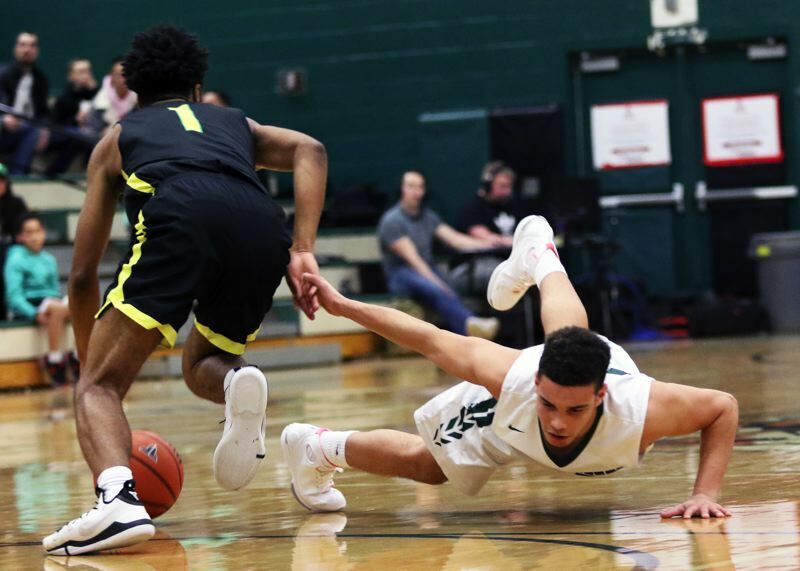 TIGARD — It was a game that featured some pinpoint outside shooting. Athleticism was abound all over the court. There were big stops on defense and clutch play on offense. But, in the end, it all may have come down to just one basic part of the game of basketball — free throws. 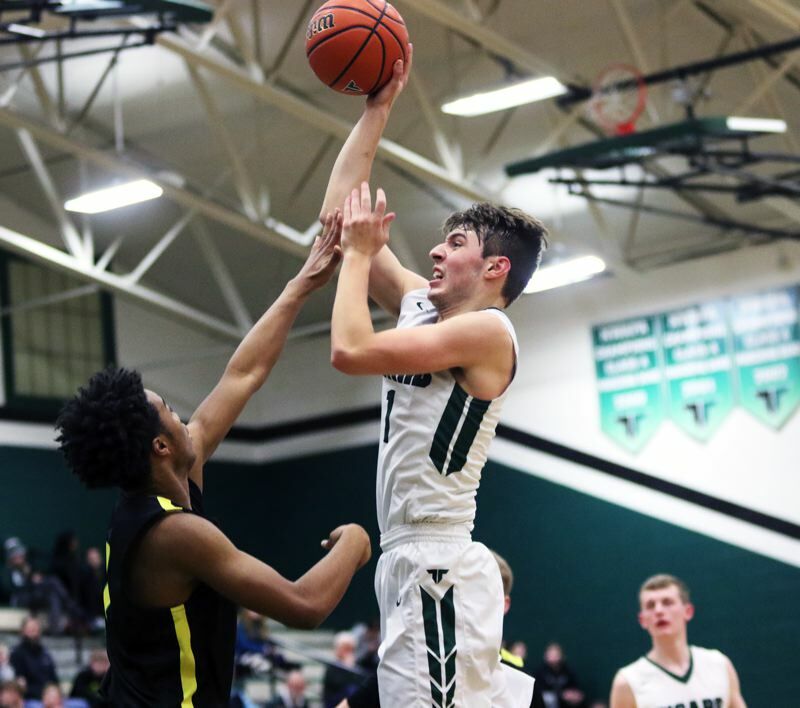 The Tigard High School boys basketball team was nearly flawless from the foul line. West Linn, on the other hand, struggled at times from the stripe. And, while the Tigers could possibly say that other elements — such has teamwork and desire — could have been a factor, their free-throw accuracy may very well could have been the difference. 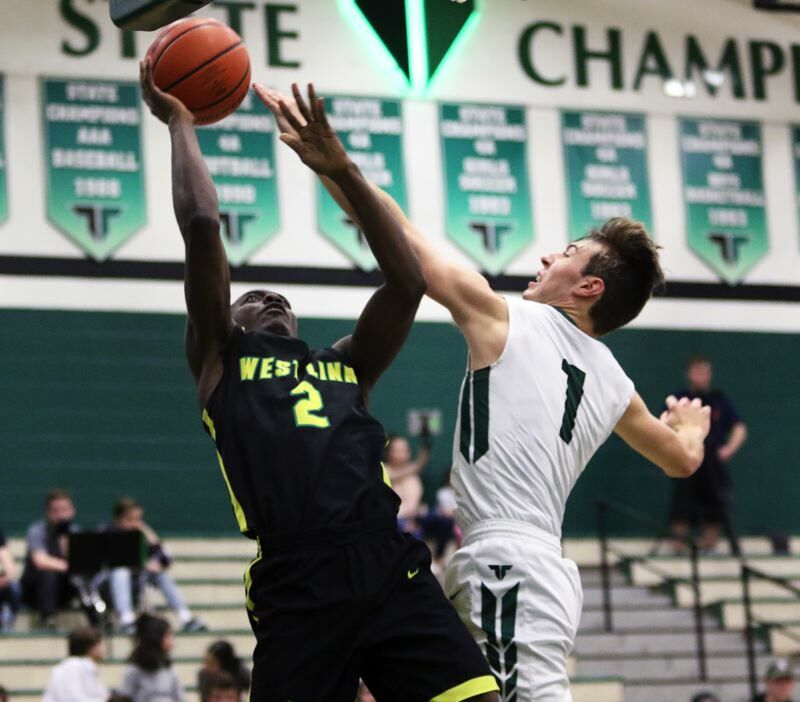 Tigard, going 10 for 10 from the free-throw line in the decisive fourth quarter, while West Linn shot at an 8-for-16 clip in the period, came away with a hard-fought 66-63 win over the Lions in a key Three Rivers League game played in front of a raucous crowd Friday at Tigard High School. "It's really big. 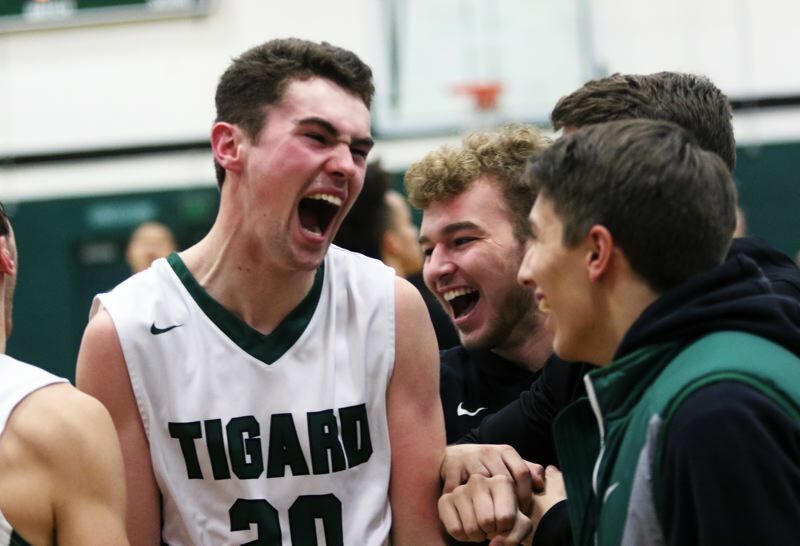 That's a real good team," said Tigard senior Stevie Schlabach, who led the Tigers with 25 points. "Those free throws were huge. Free throws can change the game at any time. It can come down to those clutch free throws to decide a game, so those were huge." "It was really big. 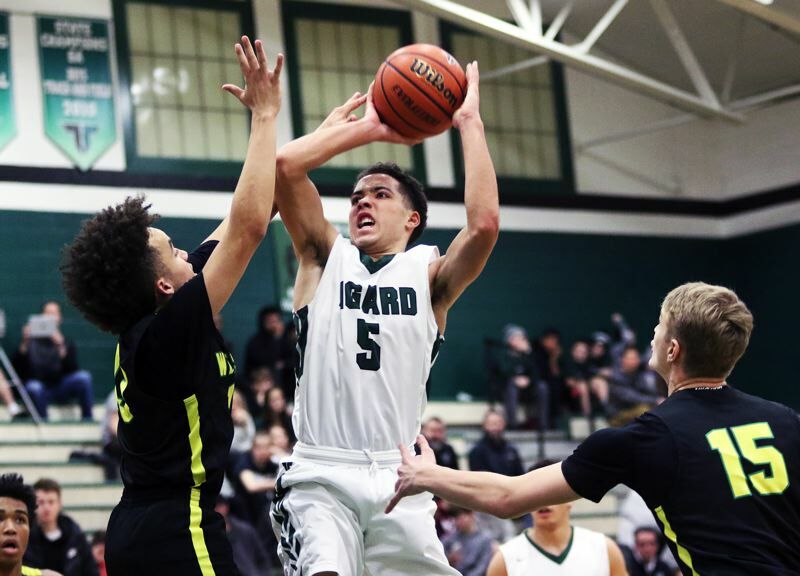 That team is a really good team," said Tigard senior Jazz Ross, who turned in a solid defensive effort while also sinking a pair of key free throws in the final minute. "We just pulled together and got the win. We had really big stops at the end. Everyone just played really hard and we had some good defense." 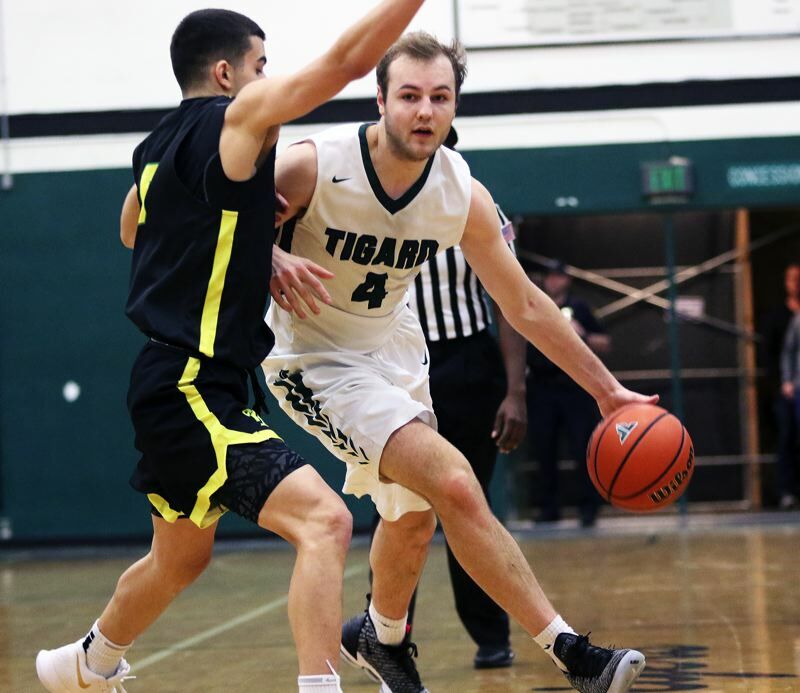 With the win, Tigard improved to 2-0 in Three Rivers League play (9-5 overall), putting the Tigers in a tie with Lake Oswego for first place in the league standings. "This will give us some momentum going into next Friday," Schlabach said. "Obviously, we're not satisfied. We need to get back to work, and there are some things we need to work on, but this was still big for us." "I think we played really well defensively," Ross said. "That was a key, because they have two really good scorers. We just had to lock in." 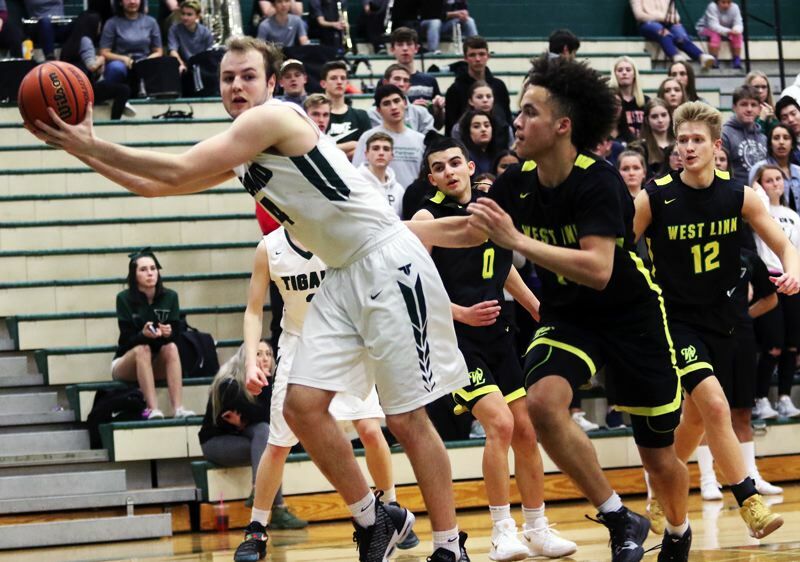 West Linn moved to 1-1 in TRL games (6-7 overall), putting the Lions in a tie with Canby for third place in the standings. 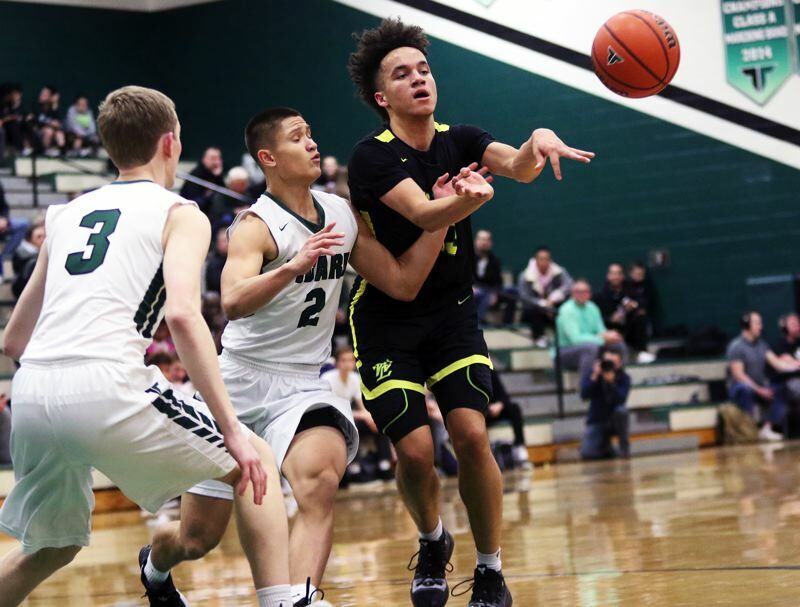 "Our free throws — we missed so many free throws at the end," said West Linn junior Bryson Crockett, who led all scorers with 27 points. "We've been working on it, but we have to keep at it." 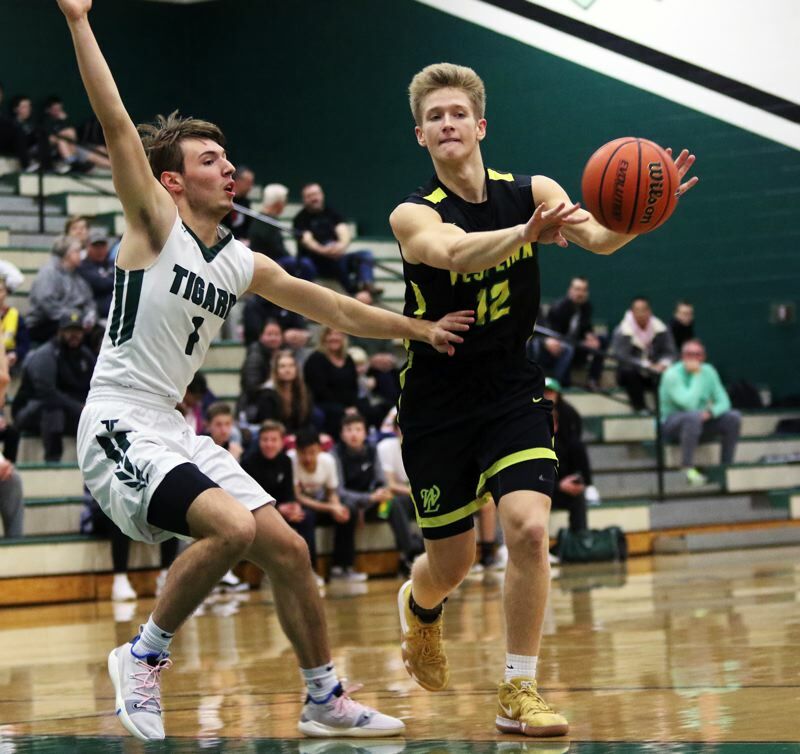 "We fell short," said West Linn junior Micah Garrett, who added 20 points. "Defensively, we were working hard the whole game. It just came down to rebounding, and we weren't rebounding like we should have. It was a good game." And it was a good game right from the start. There were four lead changes in the opening period, which ended with the teams tied at 11-11. Both teams then heated up — in a big way — in the second quarter. West Linn shot at an 8-for-14 clip from the field in the period, with three 3-point baskets. The Lions, with Crockett scoring eight points, and with Garrett having six, scored 19 points in the quarter. But Tigard was even hotter. The Tigers made 10 of their 13 shots from the field, with five 3-pointers, in the period. "We were feeling it a little bit," Schlabach said with a smile. "That was a big quarter for us." "(Sophomore) Drew (Carter) hit a couple threes, (senior) Luke (Ness) fed off of that, and then everyone started hitting them," Ross said. "It was fun." Carter sank a pair of 3-point baskets in the period, and Schlabach added nine points. The Tigers, as a team, scored 25 points in the quarter, as they claimed a 36-30 halftime lead. 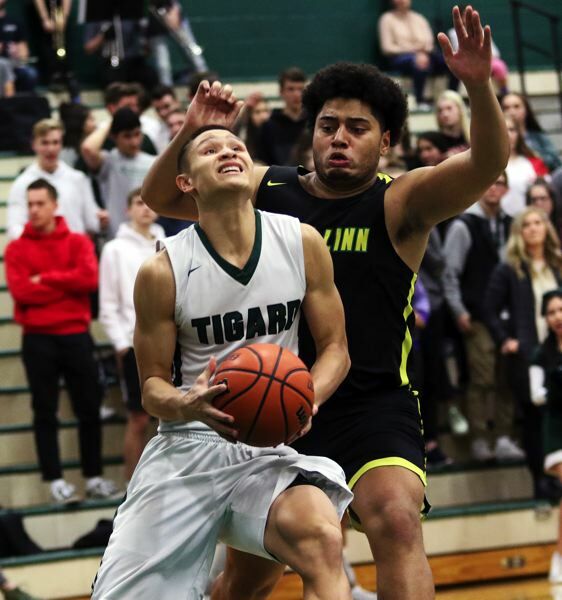 Tigard then opened the third quarter with a basket on a 17-foot jumper by Ross, a free throw by senior Diego Lopez and a 3-pointer by Lopez, off an assist by senior Jake Bullard, giving the Tigers their biggest lead of the game, at 42-30, with 5 minutes and 18 seconds left to play in the period. But West Linn immediately started to battle back. The Lions answered with back-to-back baskets by Crockett and junior Parker Durbin. West Linn would get even closer. Following a 3-pointer by junior Chris Zakariya and a pair of free throws by Garrett, the Lions would trail just 49-48 with 20.9 seconds left in the period. Tigard, with Lopez sinking a buzzer-beating baseline jumper, would go on to take a 51-48 lead into the fourth quarter. The Tigers then opened the final stanza with a 3-pointer by Lopez and a pair of free throws by Schlabach, giving the home team a 56-48 advantage with 5:40 left in the game. The Lions battle back again. 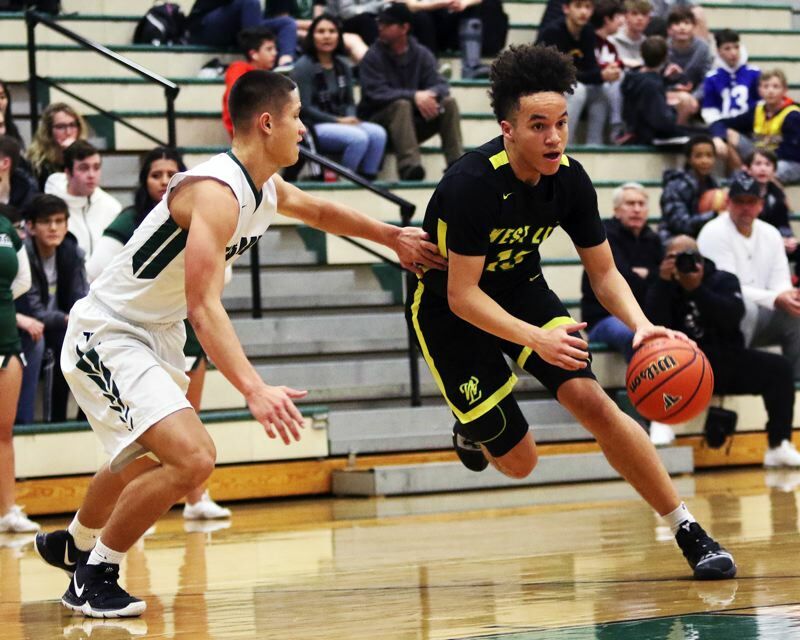 Crockett scored five points in a span of 2:02, and Zakariya connected on another 3-pointer to help West Linn trim the margin to 58-57 with 2:52 remaining in the contest. But that's when Tigard started its clutch free-throw clinic. Schlabach twice went 2 for 2 from the stripe to up the Tiger lead to 62-59 with 1:53 left to play. A pair of free throws by Garrett made the score 62-61 with 1:28 remaining. The Lions then had a chance to take the lead, as they went to the foul line for a pair of free throws with 36.6 seconds left to play. But both of those shots were off the mark, with Carter snaring the rebound off the second miss. Ross was then fouled with 23.1 seconds left to play and, in a one-and-one bonus situation, he made both of his free throws to make the score 64-61. "I was a little bit nervous, but I just tried to focus on the hoop," Ross said. "I did have confidence in myself, and I knew Stevie was going to make them, as well." Garrett was fouled with 13.3 seconds remaining, and he made both of his free throws to make the score 64-63. But Schlabach was fouled even before the ball was inbounded. He made both of his foul shots, upping the lead to 66-63, with 13.3 seconds still remaining. From there, a last-second 3-point attempt by the Lions was off the mark, leaving the Tigers with the 66-63 victory. "It was just us outworking them," Schlabach said. "We talked about that both before and after the game. We knew we had to outwork them, because the have some really good shooters. They have talent. But, when it's two talented teams, it comes down to who wants it more." "Games like this, you can't mess up, or it's the game," Ross said. "This was really fun. The bench was into it, everyone was into it. We just knew they were a good team, so we had to play hard and have fun." Schlabach made seven of 14 shots from the field, and he was a perfect 10 for 10 from the foul line in scoring his team-high 25 points. He also had 12 rebounds. Lopez added 17 points for the Tigers. Carter scored eight, while, Ross and Ness each had six. 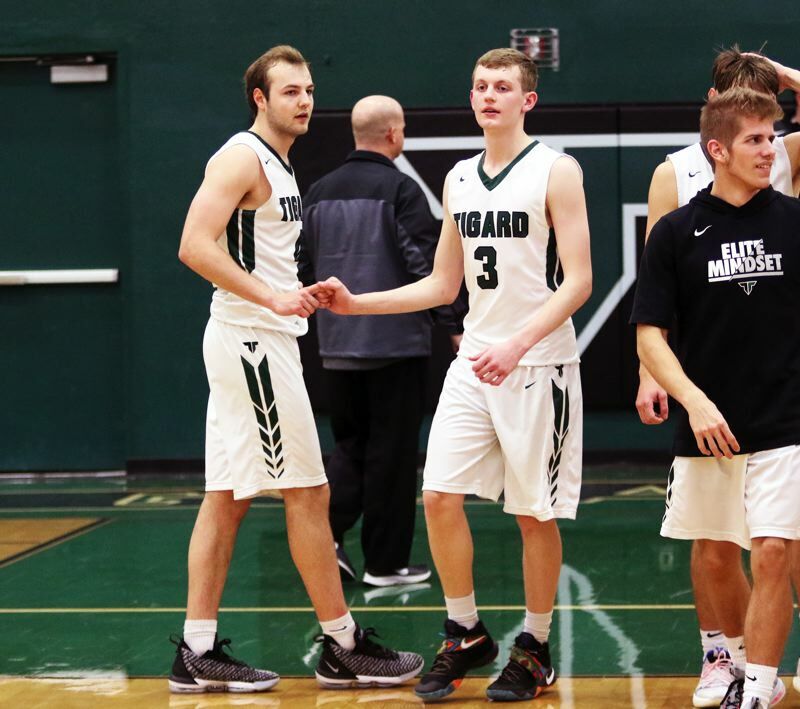 Tigard, as a team, made 21 of 45 shots from the field, with nine 3-pointers, and 15 of 18 free-throw attempts. Crockett made 10 of 17 shots from the field, with four 3-pointers, in scoring his game-high 27 points. Garrett added 20 points for the Lions. Zakariya scored six points. Junior Kelton Herrick and Durbin each had three. West Linn, as a team, made 22 of 44 shots from the field, with seven 3-pointers, and 12 of 22 free-throw attempts. "This will make us better," Garrett said. "We'll learn from it and move onto the next one. We've got a long season ahead of us, and this is just the beginning." "We started off kind of slow. Their main two players, we just gave them too many open looks and they were knocking down everything," Crockett said. "It was our free throws, and our defense in the post. We gave up too many points in the post." 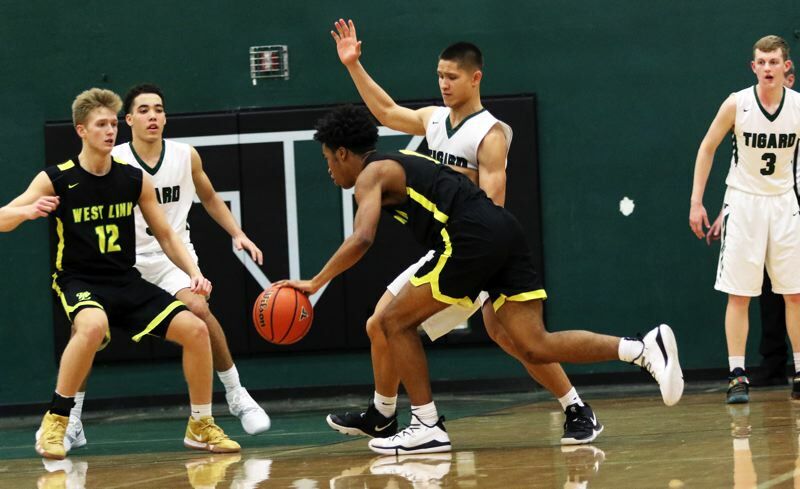 The Lions will be back in action on Wednesday, when they play at Tualatin in a league game starting at 7 p.m. Tigard will next play on Friday, when it travels to Lakeridge for a 7 p.m. TRL contest.